Andy is a screenwriter, graphic novelist, author and conservationist – writing on movie projects such as “JUDGE DREDD” and “FREDDY VS JASON” and “FOREVERMAN” for Paramount Pictures, Spiderman creator Stan Lee and legendary producer Robert Evans. He has worked on TV projects for Syfy, Netflix, ITV and Amazon and is working extensively between the UK, US and China. 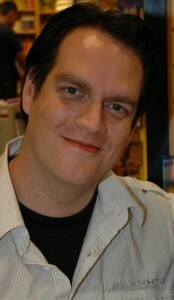 Andy went on to work on Warner Bros.’ animated “AQUAMAN” – while at the same time landing an eight-book deal with Oxford University Press for “HERO.COM” and “VILLAIN.NET”. His comics and graphic novels include MADISON DARK, RITUAL and DINOCORPS. He has rebooted the classic character TARZAN, with a series of contemporary books TARZAN: THE GREYSTOKE LEGACY, TARZAN: THE JUNGLE WARRIOR and TARZAN: THE SAVAGE LANDS. His latest series of middle grade novels – THE INVENTORY – is published by Scholastic. In September his new Middle Grade book, DRONE RACER marked his 31st publication. 2019 sees his debut novel for adults, CONTROL-S, published by Orion. He wrote and Executively Produced the UK/Chinese movie – LEGENDARY – starring Scott Adkins and Dolph Lungdren. In 2018 his latest movie, CROWHURST (directed by Simon Rumley, Dist. Studio Canal),was released this year to critical acclaim. SUPERVIZED (directed by Steve Barron, starring Tom Berenger, Beau Bridges ) will be out early next year and THE GREATEST KNIGHT will enter production in the spring.